Writers: Anthony McCarten Stars: Gary Oldman, Lily James, Kristin Scott Thomas, Ben Mendelsohn, Ronald Pickup, Stephen Dillane, Run Time: 125 min Rated: PG (Canada), PG-13 (MPAA) for some thematic material. 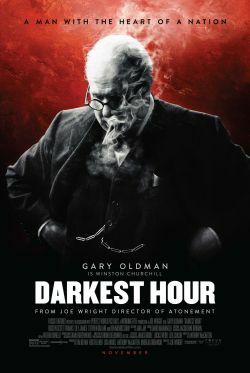 For those who prefer historical dramas brimming with backroom conversations and political manoeuvrings Darkest Hour is your cup of tea. While the film, directed by Joe Wright, makes a great companion piece to watch alongside writer/director Christopher Nolan’s Dunkirk (2017), the events of Dunkirk are not the central story but form more of a B-plot to its main story about whether Britain should sign a peace treaty with Hitler. That’s the central struggle Churchill faces as he deals with the former Prime Minister Neville Chamberlain (Ronald Pickup) who remained the influential Conservative Party Leader, and Viscount Halifax (Stephen Dillane) who was actively vying to replace Churchill as Prime Minister. Churchill carefully kept both these men close to him in his War Cabinet. At the same time, he needs both the support and respect of the King and the people to succeed. Honour your father and your mother. What does this mean? We should fear and love God so that we do not despise or anger our parents and other authorities, but honour them, serve and obey them, love and cherish them. In the film Churchill is shown carrying the weight of the world on his shoulders as he must judge between what to tell the public about the bleak nature of the war at hand and what, for their good, to withhold. As Prime Minister of Great Britain, he holds weekly meetings with King George VI (father of Elizabeth II). Because of their governmental relationship and responsibilities, the growing bond and trust between Churchill and the King becomes a good example of men fulfilling the 4th Commandment. 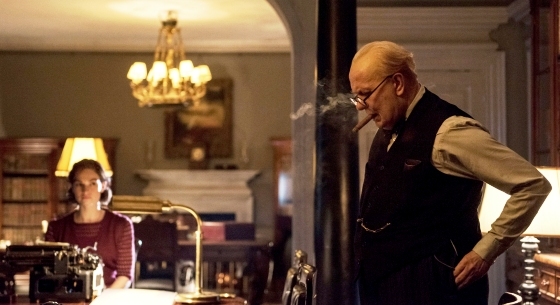 Churchill is shown as one who, by the film’s end, honours his king, serves and obeys him, loves and cherishes him, and the relationship flourishes to one of mutual admiration. Both King and Prime Minister are shown making hard choices on behalf of the people who, as subjects of the Crown, honour and respect them. Writers: Jenny Bicks (screenplay by) and Bill Condon (screenplay by) Jenny Bicks (story by) Stars: Hugh Jackman, Michelle Williams, Zac Efron, Zendaya, Rebecca Ferguson, Austyn Johnsonm, Cameron Seely, Keala Settle, Sam Humphrey, Yahya Abdul-Mateen II, Eric Anderson, Ellis Rubin, Skylar Dunn,Run Time: 105 min Rated: PG (Canada), PG (MPAA) for thematic elements including a brawl. 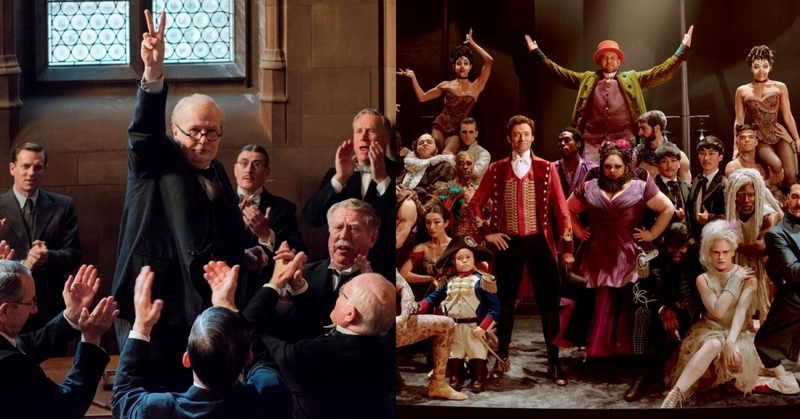 A major theme in the film is the societal emancipation of circus sideshow performers thereby lumping in the Bearded Lady (played by Tony-nominee Keala Settle), the “Irish” Giant, Jo-Jo the Dog-Faced Boy, and the diminutive General Tom Thumb (Sam Humphrey) with African American trapeze artists Anne (Zendaya) and W.D. Wheeler (Yahya Abdul-Mateen II). The film equates society’s rejection of people with disabilities and rare genetic conditions with racism. A person’s race of course is not a rare genetic condition. With only a brief wavering for dramatic reasons, P.T. 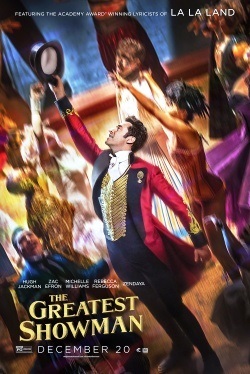 Barnum and his partner Phillip Carlyle (Zac Efron) are portrayed as champions of acceptance and tolerance for society’s downtrodden and outcasts. Overall the film generally downplays the exploitation side of Barnum’s museum and circus sideshows only delving into these areas where and when it suits them to garner sympathies for the circus performers and exhibitions. Also, the African American trapeze artists Anne and W.D. Wheeler are completely fictional characters invented to incorporate the film’s theme of overcoming racism. In the current context this film’s story acts as a stand-in deliberately paralleling the struggle for gay and transgender rights. The Greatest Showman’s music was written by the Tony award-winning composers Benj Pasek and Justin Paul who won a Golden Globe and an Academy Award for their songs in La La Land (2016) although this time the film’s music is not as ear-catching. Overall the film seems aimed at the teen market and those who grew up watching Zac Efron in the High School Musical films (2006, 2007, and 2008) and Hairspray (2007). You shall not commit adultery. What does this mean? We should fear and love God so that we lead a sexually pure and decent life in what we say and do, and husband and wife love and honour each other. 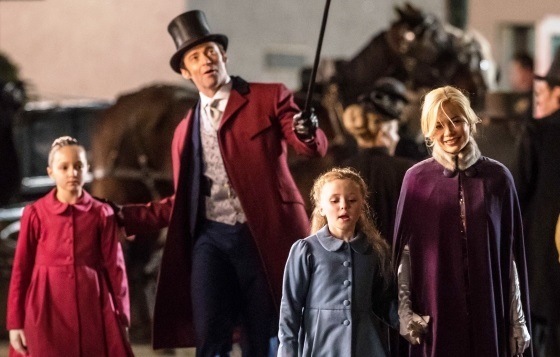 In the film Barnum is presented with an opportunity to enter into an adulterous affair with the European opera singer Jenny Lind (Rebecca Ferguson) but he remains faithful. When a scandal erupts based on false accusations Barnum again remains faithful and wins back his wife’s trust. This is a good example of keeping “a sexually pure and decent life in what we say and do,” where the husband and wife, while they have their struggles, in the end are shown to “love and honour each other.” This dramatic turn of events however is fictionalized and not an accurate depiction of what really happened between Barnum and Lind. In fact, in real life Charity Barnum didn’t briefly leave her husband over an affair— alleged or actual. They lived out a long and productive marriage until her death in 1873.